We love summer squash not only for it’s delicate flavor, but because of the dainty, edible flower that it produces. Squash blossoms are commonly found stuffed with cheese and deep fried, but Executive Chef Kurt Spataro had another idea: roughly chop the flowers and use them in a classic Mexican dish. The result was a mouth-watering quesadilla that’s sure to please anyone…vegetarian or not! Remove stems and stamens from squash blossoms and roughly chop. Slice the roasted poblano chiles into 2 inch long strips. Heat oil in shallow sauté pan, add onion and garlic, and cook for 1-2 minutes. Do not brown onion or garlic. Add the rajas and cook until they soften. Add the squash blossoms and cook, covered, until blossoms are wilted. Add 1-2 Tbsp of water if necessary to help them cook. When the bottom part of the squash blossom is tender, season with salt and add the epazote. Check seasoning, then remove from pan and let cool. Place some of the cooled mixture and a strip of cheese on corn tortillas and fold in half (or make empanada-style quesadillas using fresh masa). Cook quesadillas on a hot griddle or cast iron skillet until cheese is melted and filling is hot. 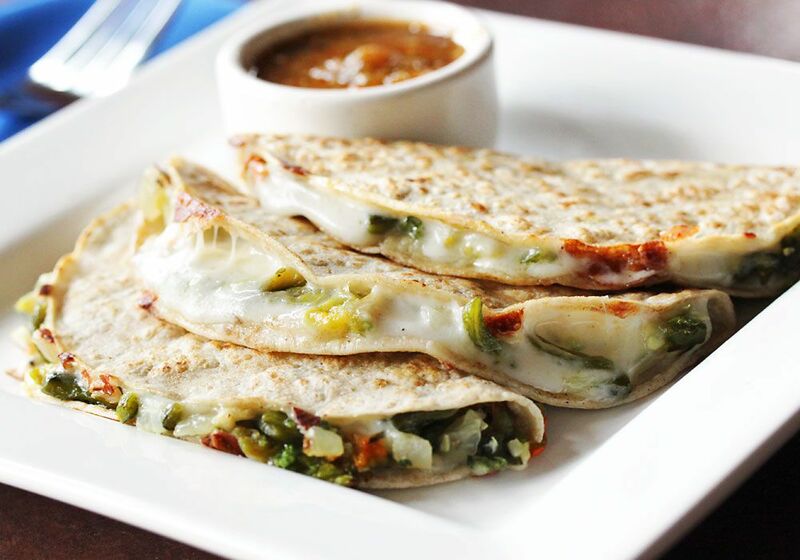 Serve quesadillas with salsa, guacamole, or both.